Africason | African School | Africa son | History | Black Consciousness | Education: The Lost History. Why was black history stolen? The Lost History. Why was black history stolen? Who stole black history? Why was black history stolen? The science of archaeology, paleontology, and genetics has all proved beyond any doubt that human life originated in Africa. They have all shown that the first humans that ever lived had lived in Africa. See using DNA to trace human origin and migration. Then, click through 1-19 to learn. Alternatively, you may watch the video below. It was summarized in this video (9 minutes only). Despite facts from the science of genetics about human origins, yet western movies, books, continue to present Adam and Eve as whites. Despite facts from archeology and paleontology, yet Hollywood and cinemas continue casting bible characters as whites! How could Adam and Eve be white; when human life began in Africa? 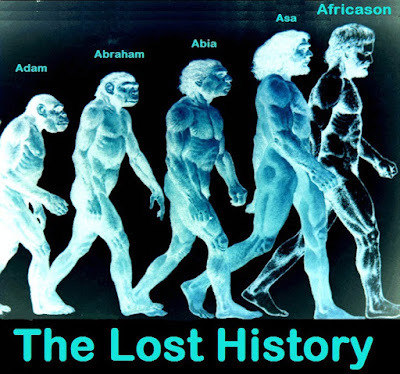 How could Adam and Eve be white; when the first humans lived in Africa? Just think about it. Adam and Eve, or whoever was the first human on earth (whether by evolution or creation) must have looked like a typical African man and woman. And, since Adam and Eve had children, it follows that their children must have been blacks also. Adam begot Seth, Seth begot Canaan, e.t.c. Noah must have been a black man, Moses must have been a black man, down to Jesus the messiah. Again, note that this is the conclusion of science, not my conclusion. Humanity originated in Africa, and from here we traveled to Arabia, Europe, Asia, South and North America, Australia. What this means is that blacks have been everywhere on this planet long before the emergence of any other race. What this means is that once upon a time, black people were the only people living on planet earth. This is why I think those who do racism are fools because there’s only one race on earth- BLACK MAN. Every other race is a mutation, just an offspring of black man!. Every other race is a product of a black man!!. Now, this article is not about religion, but about history. So, every historical source must be quoted, just as the science of genetics and archeology are being used. The bible and Torah were written over 3,000 years ago, and owing to their age, they've become historical documents whether myth or real. They need to be quoted as well because no matter what ancient source you check, the truth is always there. The truth is the truth. The truth never changes. Both the Torah and Bible said Noah had 3 sons, namely; Ham, Shem, Japheth. Genesis 9: 20-27. 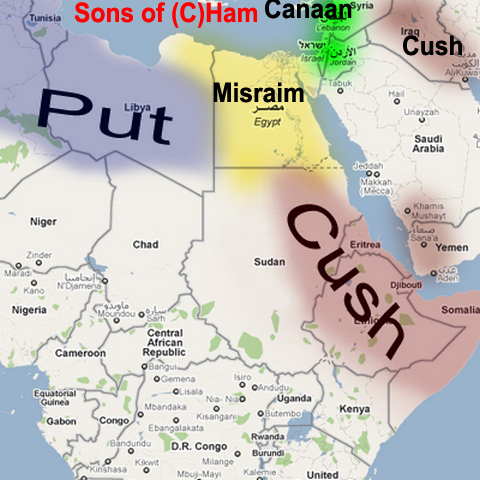 Later, Ham grew up, married and had 4 sons, namely; Cush, Mizraim, Phut, Canaan. Genesis 10: 6. Also referenced in 1 Chronicles 1:8. The map below shows ancient names of northern Africa, Europe, and middle east region. Above were the ORIGINAL names of these lands. And you can clearly see African presence in the bible. But, in order to whitewash the bible, European scholars had to rename MIZRAIM to Egypt and CUSH also renamed Ethiopia or Nubia. The bible and Torah in Amos 9:7 called children of Ethiopians the same as children of Israel. It reads "Are ye not as children of the Ethiopians unto me, O children of Israel? saith the LORD. Have not I brought up Israel out of the land of Egypt?" Note that the place called Egypt today; including most of the Middle East and the Mediterranean were inhabited by black people at that time. The place known today as Egypt was a civilization that developed later from Ethiopia and Sudan. The Egyptians themselves said they came from the hinterlands of Africa at the beginning of the Nile river. The River Nile begins in Congo, Burundi, Tanzania, Rwanda, Kenya. Their God and monarchy didn't originate in Egypt in North Africa, rather, it originated thousands of years inside Africa before Egypt. Example; Pharaoh Taharqa or Tiharqa (690 BC - 664 BC) ruled from Ethiopia/Sudan. Pharaoh Taharqa or Tiharqa was mentioned in the bible at 2 Kings 19: 8-13, 2 Kings 19: 9, 2 Kings 19: 8. Pharaoh Menes 3,150 BC - 3,100 BC unified the two kingdoms. Other Pharaohs that ruled the two kingdoms includes Pharaoh Shabaka 712 BC - 698 BC and Tarhaqa 690 BC - 664 BC. Again, ancient Egypt was divided into two kingdoms, known as Upper and Lower Egypt. The pharaohs were known as rulers of the Two Kingdoms; namely, upper and lower Egypt. While the labeling of "upper" and "lower" might seem counter-intuitive, with Upper Egypt in the south and Lower Egypt in the north, the terminology derives from the flow of the Nile from the highlands of East Africa (upstream) to the Mediterranean Sea (downstream). Lower Egypt is to the north and is that part where the Nile Delta drains into the Mediterranean Sea. Upper Egypt is to the south- down to the African hinterlands where the flow of the river Nile begins. The REAL Israelites are still in Africa today, however, many were sold to slavery between 1500 AD - 1800 AD. A white man CANNOT be an Israelite!. Any place you see Israel in the bible, replace it with ETHIOPIA or SUDAN!. That's the real name!!. For clarity, below is a map representing Noah's 3 sons and the lands they possessed. Judah (Jews)/Jesus Christ/Hebrews were later to become the descendants of Ham- the black man. You can be rest assured Judah are blacks because both the bible and Torah said so. In the bible book of Song of Solomon 1:5-6 (KJV), Solomon explicitly said ''I am black, but comely, O ye daughters of Jerusalem, as the tents of Kedar, as the curtains of Solomon. Look not upon me, because I am black, because the sun hath looked upon me: my mother's children were angry with me; they made me the keeper of the vineyards; but mine own vineyard have I not kept''. There is no shortage of bible or Torah passages showing that the Jews/Israelites were black people. The book of Jeremiah 14:2, reads "Judah mourneth, and the gates thereof languish; they are black unto the ground; and the cry of Jerusalem is gone up". According to English language, the "subject" here is Judah and "they" is a pronoun replacing Judah. So, don't let anybody spin it to fool you. Judah is as black as the soil!. You have to be black to even qualify as a Jew!!. The question is not whether ancient Hebrews and biblical characters were blacks, it’s not even up for debate, because there’s overwhelming evidence for that, both in science and the bible itself. The question we should be asking is; why was black history stolen?. Who stole black history?. Why was black history stolen?. You would expect black people to be asking the above questions. But, no, we don’t ask such questions. Instead, you’ll hear blacks asking questions like; does it matter if Adam and Eve were blacks?. Others would ask; does it matter if Jesus was black?. The brainwashing and subduing of black people began the moment our history was stolen by Rome. It was from then on that blacks were brainwashed to believe the white supremacist mindset that has got us thinking whites are the "be all and end all". From then on white supremacists and brainwashing Euro-centric education started coining new worlds to make us hate ourselves. Words and phrases that were coined and still being coined to humiliate the black race includes; black day, blackguard, black sheep, black mood, black widow, blackmail, black money, blacklist, black Thursday, black marketeer, blackhead, blackball, black market, black out, black death, black maria, black knight, black Monday, black spot, black economy, black ice, black look, black magic, black mark, black ops, blackout, blackjack, black hole, blackleg, black Wednesday, blackboard jungle, black eye, black mass. Basically, everything bad was to be associated with black man/satan. While words like; White lie, white magic, white list, e.t.c were associated with goodness/white man. You see, the hatred against the black race is DEEP rooted in their gene and consciousness!. The easiest way to restore our self-esteem is to study history, cause when we do, we will discover everything white people have written down as history is a pack of lies deliberately created to put down black people. Black people must understand that the history of a people will determine whether their present would be that of confidence or subdued. For example; if you’re not too bright of your history, it’ll also make you feel subdued in the present. It, therefore, follows that if you’re proud of your history, it’ll also make you confident and proud of your present. Are you proud of Martin Luther King? YES. Are you proud of slavery? NO. Most magnificent black history was deleted from the history books within the 16th-18th century in a time known as the renaissance period in Europe because Europeans know the importance of history, and they knew in advance the best way to get us out of the way was to steal the good sides of our history. And, by erasing proud black history from the history books, Rome for example; assumed the custodians of Christ’s legacy ever since, when in fact the Roman empire was an enemy of Jesus Christ during his time on earth. During Jesus's days, Caesar Augustus was the king of Rome and Herod king of Judea and environs, while Pontius Pilate was the Roman governor. Rome was a colonial force occupying Jesus's birthplace, collecting taxes and exploiting the locals. Rome was there like any other colonial power invades a foreign land. Pontius Pilate sentenced Jesus to death. As you can see, Rome has no right of credit to Christ’s legacy!. They had a hand in his death!. How could your enemy become your best friend after you die?. Yet, this’s exactly what happened in the case of Jesus Christ and the Roman empire!!. Associating Rome with Jesus Christ is like giving the right of inheritance to an assassin that killed you!. This is why when you research it, you’ll discover it is overwhelmingly clear that the ethnicity of Jesus was grossly distorted to fit the perspectives of Europe. All the credit that should’ve been given to black people is now instead being erroneously given to Rome who actually facilitated the killing of Jesus Christ. By so doing, blacks have lost out on Christ’s heritage and the pride that would’ve come with it as our blood brother. So, today who lay claim to Jesus Christ’s legacy? ROME. Recently, I heard T.D. Jakes over the radio talking what he knows nothing about by suggesting ancient Jews and Hebrews were not blacks. What nonsense!. The only proof he has according to him is that he’ve been preaching for 32 years. He’ve been preaching Roman indoctrination for 32 years, without caring to investigate his history or and what science has to say about the origin of mankind. I've just released these two songs; (1) The lost history, (2) Melanin. These songs seek to re-engineer the minds of black people in order to restore true history, confidence and the birthright of Black man. This's not about religion, but about the restoration of stolen black history. If you're a regular to this blog you'll know this is not the first song I have done. But, this song is special as it addresses a very important issue concerning the black race. Slavery wasn't just physical. Slavery was also mental and in order to achieve mental slavery, one of the mischievous thing white people did was that they made sure historical characters associated with greatness were renamed to white people. When the French army led by Napoleon conquered Egypt in 1789 AD, he went as far as destroying artifacts and structures suggesting black civilization in Egypt. Even till today, historical black characters are still being cast in Hollywood movies as white people. Till today, historical blacks are still being presented in books and magazines as white people. Despite, Pythagoras studying mathematics in Africa many centuries before Isaac Newton, Black man gets no credit for the invention and development of mathematics. Instead, western scholars treat Pythagoras as a myth, simply because he said he studied mathematics in Africa. Despite, both the science of genetics and archaeology proving conclusively that human life began in Africa, western establishments continue to present Adam and Eve as white people. Example; Jehovah's witness continue to draw Adam and Eve as whites on their international watchtower and Awake magazine. Hollywood also continues to cast them as whites. How could Adam and Eve be whites; when the first humans lived in Africa?. You see, history is full of blunders against the black race, and education, movies, books, continue to be used as instruments of mental slavery. The black man has been schemed out of his own history!. As a result, white people subconsciously considers black man as an inferior race that contributed nothing or lacks the capability to contribute to the world's development, when in reality black man created the world. Black man on the other hand subconsciously accepts the reality history has placed upon him. The effect becomes inferiority complex on the part of black man, and superiority complex for white man. This is what is fueling racism!. Black people must reclaim our position on this earth, cause the truth is the black man created the world!. If we do not take action, some thousand years in the future, someone is going to teach our children in school that Martin Luther King was a white man!. If we do nothing now, someone is going to teach our descendants that Nelson Mandela was a white man!. You might find this funny, but it's not funny at all. Rather, it's something to be sober about.
. Jesus Christ is already successfully presented as a white man.
. Hannibal is already being successfully presented as a white king.
. Adam and Eve is already successfully presented as whites.
. Europe is already being successfully presented as the origin of education, when in fact, the first universities on earth were all in Africa. The schools are still there, and they are:- Al-Azhar University in Egypt (North East Africa), Sankore University in Timbuktu Mali (West Africa), Fez university in Morocco (North-West Africa). These three universities predate any university in Europe and the world. Indeed, Europeans and Asians studied in Africa and they said so. Pythagoras, a Greek Mathematician wrote that he studied Mathematics in Africa along with many other Greek intellectuals of old. In the face of hard evidence though, Europeans eventually acknowledge the first university on earth was in Africa. See Guinness World Records for the oldest university in the world at http://www.guinnessworldrecords.com/world-records/oldest-university What they don't even know is that Sankore university in Mali predates Fez university in Morocco. Nobody knows how many of such universities that were scattered all over Africa before slavery, but forgotten by history.
. Bill Gates is already successfully presented as the richest man ever lived, when Mansa Musa of Mali is the wealthiest man ever lived.
. Sumerians have already successfully been presented as inventors of mathematics, when in fact their ancestors studied mathematics in Africa.
. Credit has already been successfully given to Europe for sciences, when in fact it took a deep knowledge of Physics, Geometry, Astronomy, and mathematics, to build the Egyptian pyramids.
. Credit has already been given to a Mungo Park as the discoverer of the river Niger, when in fact, Mungo Park employed the services of Africans to show him the route to the river Niger. The list is endless. Modern man (homo sapiens) migrated or exodused out of Africa about 60,000 ago to Arabia, Eurasia, Australia, Asia, Brazil and the Americas, e.t.c. Science confirms a massive exodus of people out of Africa. The bible also stated the same!. The bible stated in the whole book of Exodus that there was indeed a massive exodus of people in and out of Africa up till the end of the ice age. The bible characters remain the same people that exodused out of Africa, and their descendants!. The biblical Jews or children of Israel were Africans migrating in mass in and out of Africa due to climate change!. Please see a scientific research on African migration "out". See another research on African migration "in". It kept happening that way for a long time until the world climate stabilized and people were able to live in a permanent location and were able to begin farming during the Neolithic period. There were severe and erratic climatic change happening then, such that sometimes it would rain a whole month non-stop and people would be terrified as it seems the whole earth was inundated with water, as recorded in the story of Noah, only to give way to severe drought and famine as recorded in the story of mosses and the children of Israel (Africans) in the Sahara desert. All these recorded in the bible. Below is a map of North-west and East Africa plus the Middle East. A close examination of this map is enough proof of journeys by the so-called Israelites. 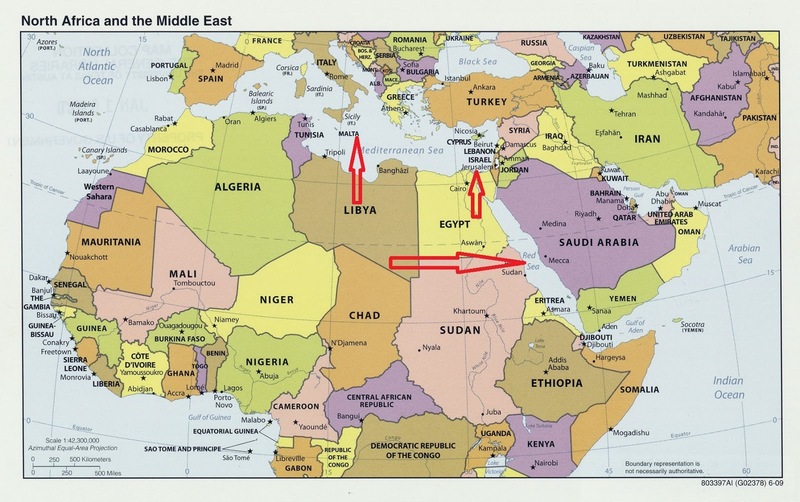 As you can see for yourself above, the three arrows correspond to journeys out of Africa to the Middle East. For example; you can see the story of Moses dividing the red sea was a journey originating from either Sudan or Egypt across the red sea to Saudi Arabia. It is clear that any journey to Israel or the Middle East would mean a Pharaoh and his army were dealing with Israelites in South East of Egypt or North East of Sudan, forcing them to cross the red sea and re-routing their way from Saudi Arabia. This clearly shows the original Israelites must have been migrating from the southern part of Egypt, to begin with- totally corresponding to the science of archaeology, paleontology, and genetics that proves Adam and Eve and their descendants first lived in the Southern part of Egypt. The southern part of Egypt is the true origin of the Israelites the bible talked about!. The southern part of Egypt includes but not limited to anywhere from Sudan, Ethiopia, Chad, Central African Republic, Kenya, Nigeria, Uganda, Ghana, Cameroon, Gabon, down to South Africa. I' am not a bible quoter, but I must say here that indeed the bible said when the messiah returns he will go back to Southern Egypt and other locations to recover his people that remain there!. The book of Isaiah 11:11 reads "In that day the Lord will reach out his hand a second time to reclaim the surviving remnant of his people from Assyria, from Lower Egypt, from Upper Egypt, from Cush, from Elam, from Babylonia, from Hamath and from the islands". Clearly, the Israelites were Africans migrating out of Africa!. The map clearly shows the direction of their journey. The map cannot lie!. If not for the innate humble and humane nature of the black race, we could have as well broadcasted ourselves as God as we populate the world. Had we done this, the issue of racism against the Black man wouldn't be here today. White people would've simply believed that we are God. How else would they know we’re not?. The root of racism is that whites think of blacks as inferior. The real reason a white policeman would shoot an unarmed black man is because he thinks we're not as human as he is. We can change all that by re-engineering the minds of the black race with raw facts of science and history showing that we actually created the world!. I've already started this project by recording these three songs. Unfortunately, I do not have the resources to get the song heard worldwide, cause I'm an independent recording artiste not with a record label. Neither, am I in the radio or media where I could get it heard. Check iTunes or Amazon for (1) The lost history (2) Melanin. I sang about these things. Artiste name: Africason. Whited-Out: The Erased History of Black people.